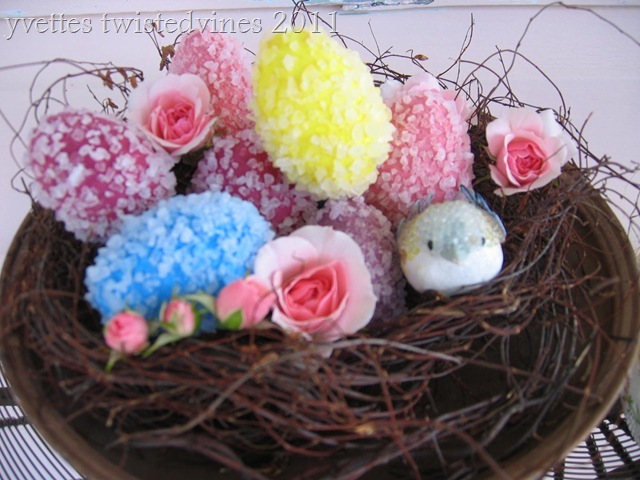 So come on friends get cracking and hatch a few whimsical dressed eggs for a festive statement in your home. 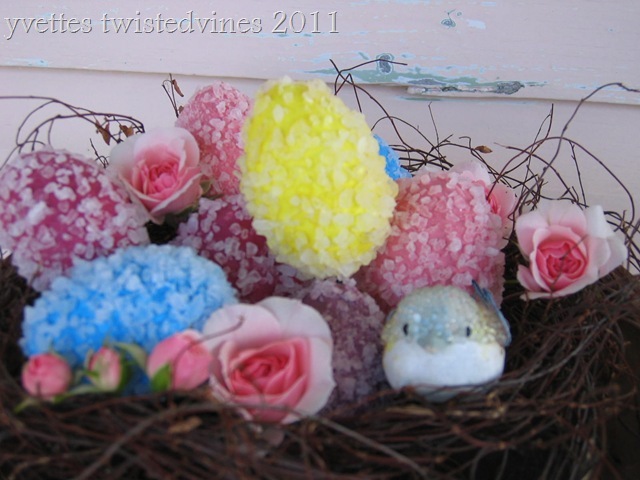 These covered styrofoam eggs are delightful, and bring a little ‘bling’ into your Easter displays. So easy to make, fun and charming. 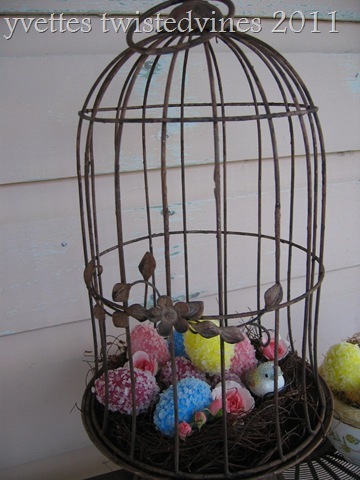 Decorative Easter displays will just shine and dazzle! 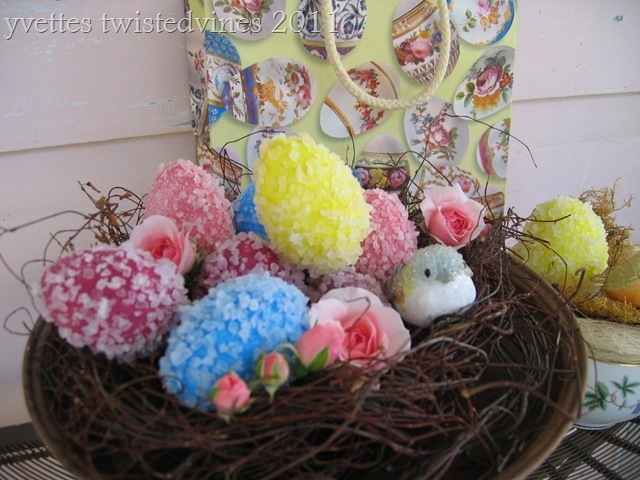 Read on for a full tutorial of these Easter eye catchers…. Acquadhere: any pvc wood glue / craft glue which dries clear, water based and non toxic. 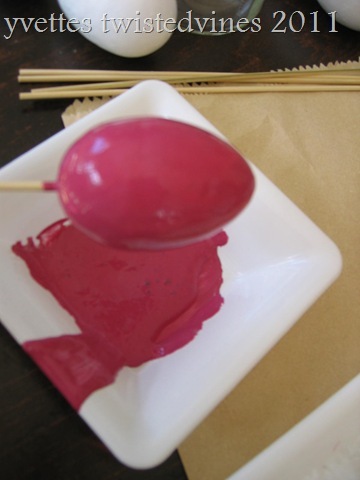 Prepare each egg , by gently pushing a wooden skewer into the base of the egg. This makes it easier to handle the egg. Prepare your watercolour based paint, (I chose Easter pastel colours of blue,yellow, pink, and purple) by mixing paint and the pvc glue together. 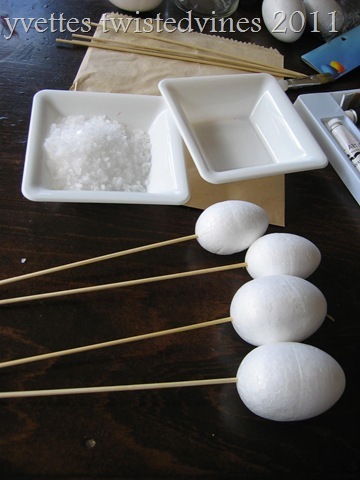 Paint the glue mixture evenly over the styrofoam egg, not too heavy. Leave for a couple of minutes until tacky but not set. Place in glass jar to rest. 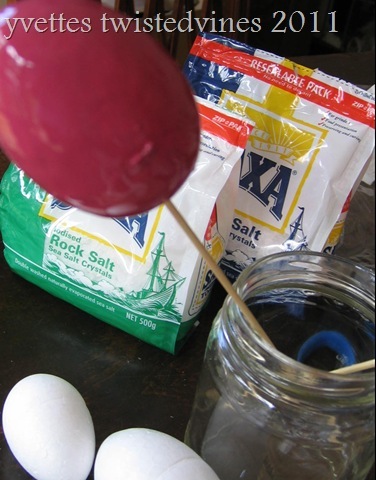 Place rock salt into a plate, and cover the covered glue painted egg. Tip: Don’t roll the egg into the salt instead sprinkle the salt over the egg above the plate. This ensures an even amount of salt layering, and cleaner rock salt flakes. Lightly shake and leave to dry. Leave the eggs 24 hours to dry. They’re now ready for your home Easter displays, you can even put them into a pretty basket as a special gift. Linking to The DIY Show off. A project parade of talented and inspiring creators. Love that raspberry color = very neat craft! 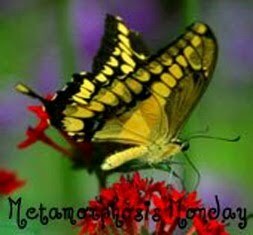 Thanks for visiting and commenting at my blog. First day to us our new light box hubs created for me today. 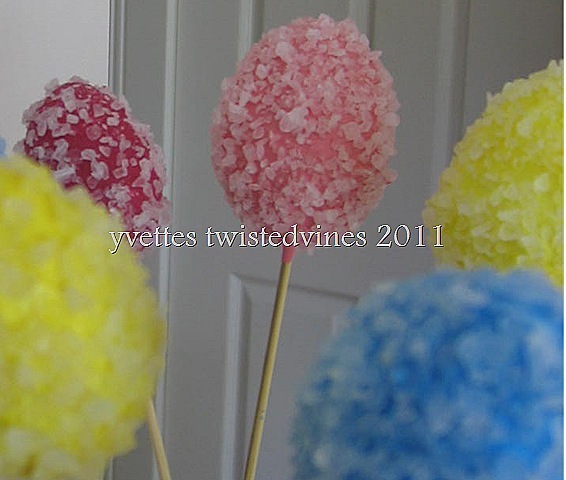 Hi Yvette, All of your recipes look fantastic! I will definitely have to try some of these. Thanks for visiting my blog and leaving your kind comment. Thanks for the great idea, Yvette! Great craft for Easter! Thank you. Oh my gosh — these are SO pretty! Just need to dash and get some rock salt (used all of ours during this horrid winter!) — thanks for sharing! Okay, how cool are those? I wonder if I could use epson salt (I have that already). Hmmmmm. Those look good enough to eat!!! 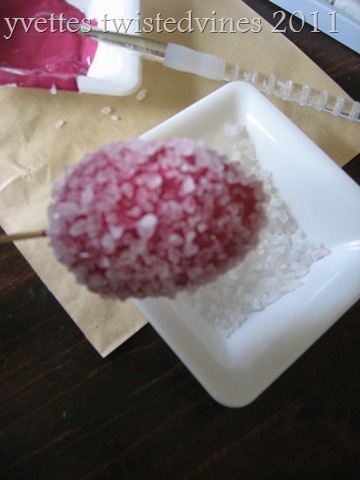 Hi, I’m not sure of the result if using epson salt, apart from rock salt, I’ve used salt flakes. I can only say be adventurous and try it…that’s the fun!. The cost of making these is minimal…so do try them, they have a great result everytime.! These are soooo cute! I love the big salt on them…but where do you find salt like that?? I would love for you to link up at my Friday link party if you are interested.